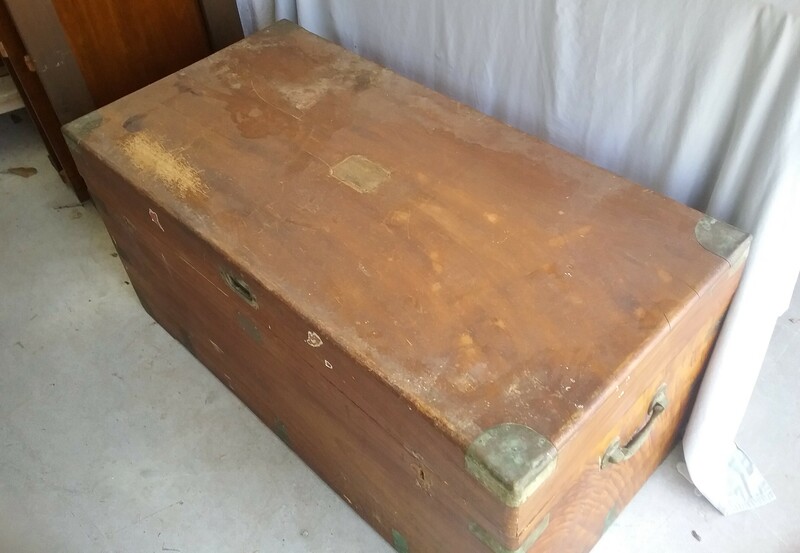 This camphor chest dates back to 1888 and belonged to a military family for many years. 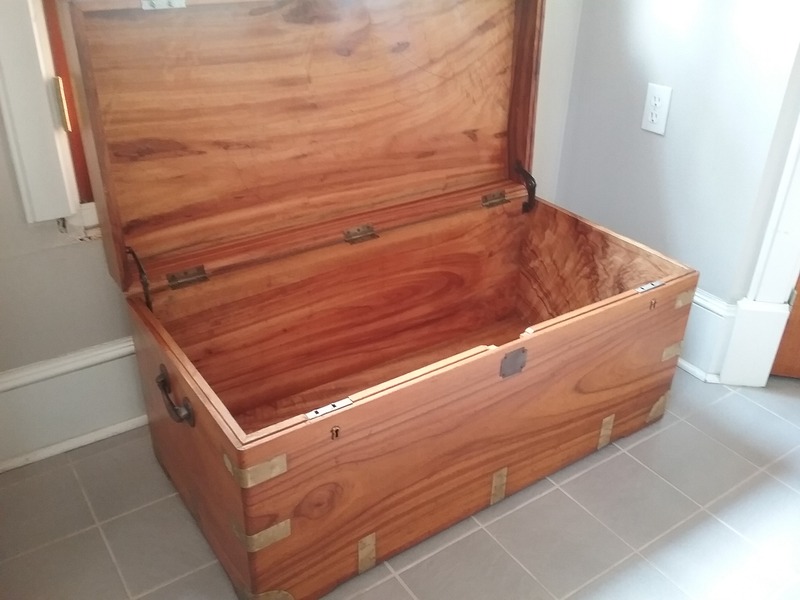 Our client remembers the chest at her grandmother's home and being full of dressing up clothes that her and her siblings/cousins used to play with. Very fond memories and part of her life growing up! Camphor wood was used to store clothes and linen because of its natural insect repellant properties. The dense, durable wood is derived from an evergreen found in some parts of Australia and native to Asia. It came to us with a failed finish, badly tarnished or missing hardware, and needing a wood repair around the hinges at the back. Interestingly it was made from solid planks of camphor wood, rather than being made up of pieces of wood laminated together. This makes the trunk more valuable, simply because wide planks are rarer! The trunk was about 20 inches deep and so you have wood that has come from a large tree. Our first job was to strip the old finish from the wood and the brass hardware. We then sanded the wood revealing the beautiful grain and patterns. The hardware also needed to be cleaned and polished. 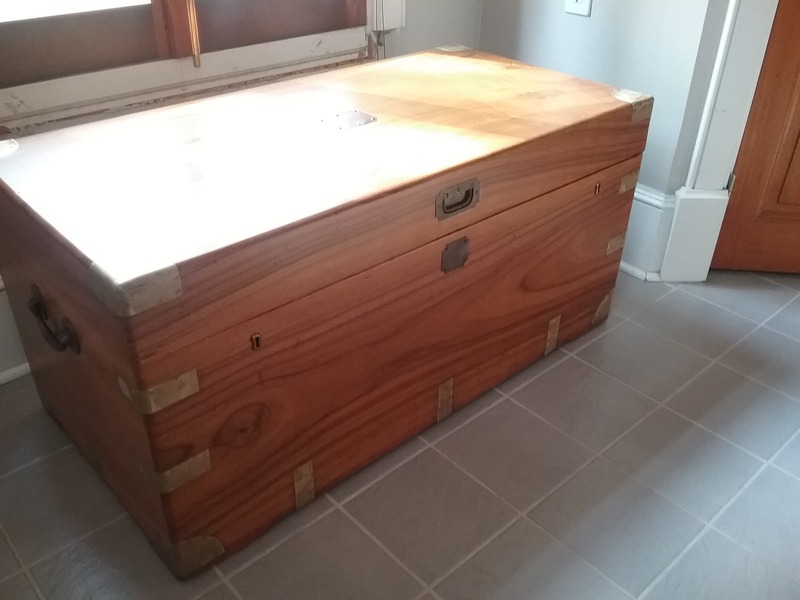 The wood around the hinges was cracked and missing with the years of use and also due to the fact that there were no stays on the trunk lid to hold the lid when the trunk was open. 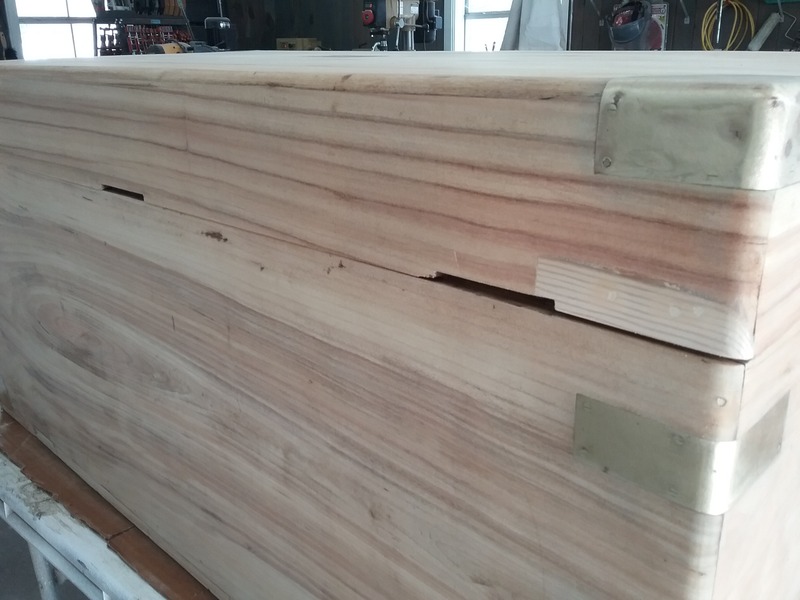 A little bit of 'wood surgery' was needed so we scarfed in some new sugar pine, this was because it was soft and similar in texture and appearance to the camphor wood. 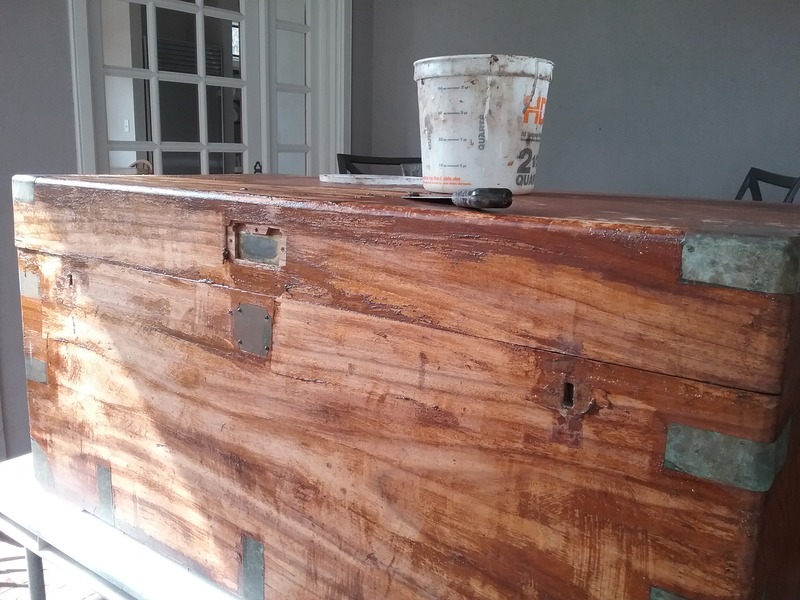 Our next step was a bit of a dilemma: one of us wanted to oil the chest and bring out the natural beauty that way but the other one preferred a hardwearing finish to protect the wood for years to come. Over to the client to decide; she decided to go for the modern finish. So, we stained the wood with a coat of Zar stain (just to even out the wood color and blend in the repair) and then applied three coats of Sherwin-Williams dull rubbed effect conversion varnish. This is very hardwearing and will protect the wood from water damage and wear and tear from the next generation of 'dresser-uppers'. Our next job was to work on the hardware. First we clean and lacquered any pieces that we could remove. Then it was time to replace the missing pieces. We had two locks on the piece and a space for a missing lock in the middle. There was also a missing plaque. 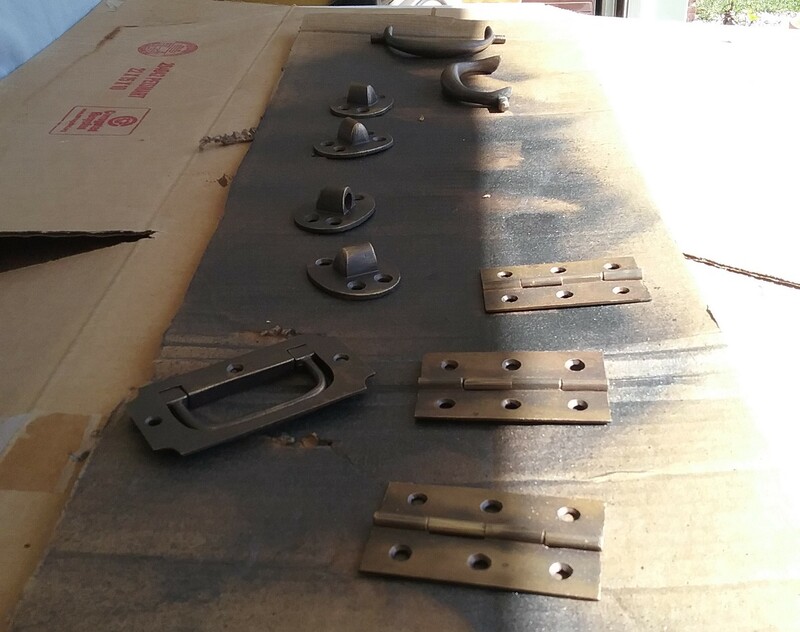 The two existing locks had no escutcheons and so we sourced some replacement/reproduction hardware for the escutcheons. Dewey also made up the missing plaque using copper plate and did a matching cover for the missing lock. 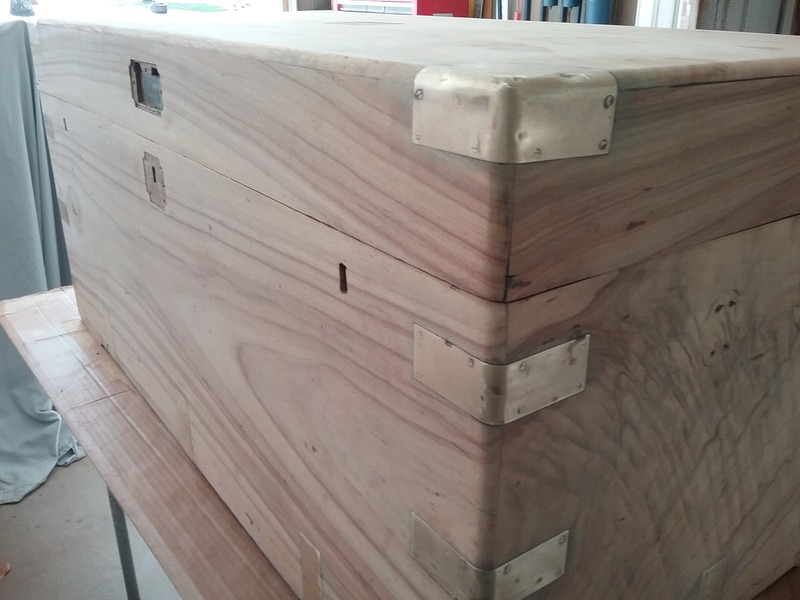 The final step was to source and install the lid stays to hold the lid when the trunk was in use.